The long-tail cast on is a great all purpose cast on, especially for stretchy edges. 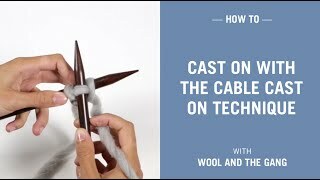 Here's how to cast on using the longtail cast on technique. 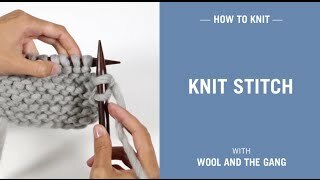 A great technique when you want to make something stretchy such as a scarf or a hat. You start by making a slip knot (we've got a tutorial for that too). Place the slip knot on needle and hold it in your right hand. Make sure that the yarn tail is sitting towards you. What you need to do now may seem a little bit complicated but stick with it. You now need to insert your left thumb and index finger between your two strands of yarn. Close the rest of your fingers around the yarn. Insert the needle under the strand that is wrapped around your thumb. Remember to hold your hand like a pistol. Then scoop up the strand that is wrapped around your index finger. Bring your yarn out through the thumb loop. Pull your thumb from the loop of the yarn and pull the yarn to tighten the new stitch. And that, ladies and gentlemen, is the long tail cast on! Repeat until you have enough stitches for your project.